Currently the second largest manufacturer of solar power inverters globally, Power-One’s Renewable Energy Solutions has seen remarkable growth in the past 12 months. 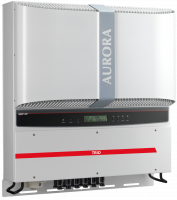 The Power-One Aurora brand of renewable energy power inverters offer best-in-class performance and reliability along with a global customer care package. The new Easy Control system offers customers the ability to monitor PV or wind installation performance from a remote location using either an Ethernet/Internet connection or mobile phone technology. Plant performance information such as energy harvesting, power, voltage and current data is available in real-time. Users will benefit from this control unit’s very high speed updates. Its modular design allows for future expansion with further features created using add-on modules. You can link up to 128 devices with the Easy Control system using RS485 communication port data. This flexible monitoring system can be linked to a wide range of output devices, including mobile phone, any online or Bluetooth device as well as the complementary Aurora Desktop monitoring system. Power-One’s Desktop product allows inverter owners to monitor performance from anywhere within 300 metres of the units. Ideal for residential and small commercial PV applications, the Desktop features touch screen colour TFT display and can be either wireless or connected. The Desktop system can also be linked via Bluetooth or USB to a personal computer and the Internet. You can watch energy harvesting data for up to six Aurora inverters at once using the Desktop monitoring system. Wireless communication requires an additional radio transceiver fitted within the inverter.